At one point in European history, all roads really did lead to Rome. As the Roman Empire expanded, thousands of miles of roads were constructed, linking cities and provinces back to Rome. Many are still in use in some capacity today, while others have been lost to time. 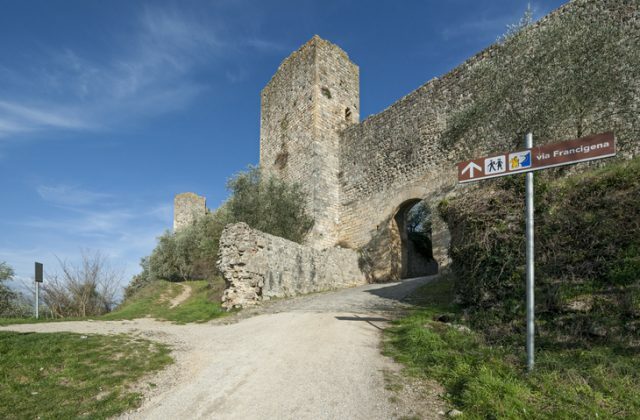 The Via Francigena was one such route that had vanished in some spots until it was retraced in its entirety in the 1980s. The Romans, by the time the Empire fell, had constructed a vast network of roads throughout Europe and the UK. In Britain alone, over 10,000 miles (16,000 km) of roads were built between 43 and 150 AD. Many of these roads continued to be used for centuries and even became regular routes that we use today. Some roads, like the Via Francigena, grew out of a series of paths, linking both established Roman roads with smaller, less-traveled routes. It was not uncommon, in the heady religious days of the Middle Ages, for people to make long pilgrimages to a particular cathedral, saint’s tomb or city. The steps of Canterbury Cathedral today have been well worn by the knees of dedicated travelers visiting the tomb of Thomas Becket, also known as St. Thomas of Canterbury. 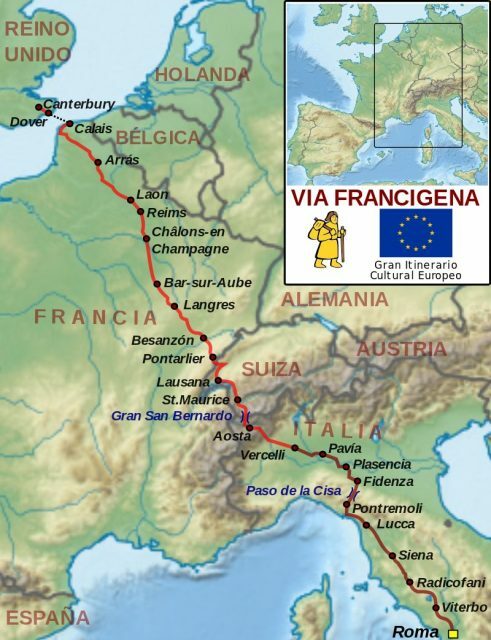 The Via Francigena itself stretched from Canterbury all the way to Rome. 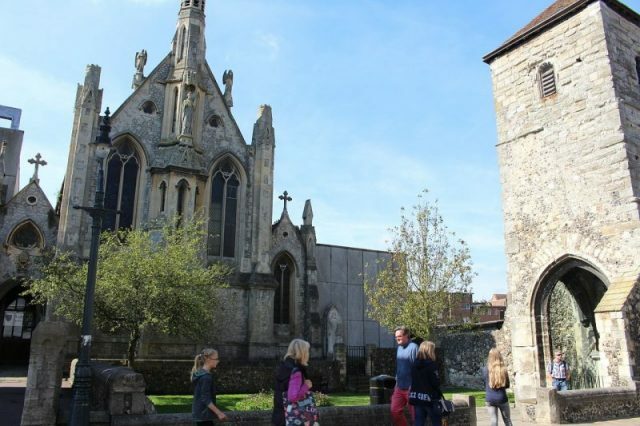 The route is believed to start inside Canterbury Cathedral and travels through France, Switzerland, and into Italy. Literally meaning “the road that comes from France,” the path was used by pilgrims in the Middle Ages who went to the Holy See in Rome to visit the tombs of Saints Peter and Paul. 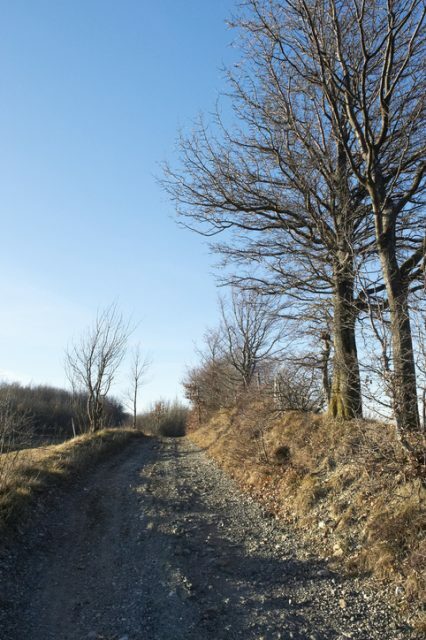 A part of the old Via Francigena in the woods, Apennines, Italy. The first documented mention of the route is from a record of the travels of Willibald, Bishop of Eichstätt, the Itinerarium sancti Willibaldi, in 725. Called the “Frankish Route” in this document, it has also been mentioned as the “Lombard Way,” as well as the “Chemin des Angliois” (“the English road”) and the “Chemain Romieux” (“the Roman Road”). At the end of the 10th century, the Archbishop of Canterbury, appropriately named Sigeric the Serious, took the Via Francigena to Rome so that he could be ordained and receive his pallium (an ecclesiastical cloak). He recorded his return journey, including all of his stops along the way back to Canterbury. As a result, we know the precise route that the Via Francigena took at that time. It did change sometimes, however, depending on local politics, weather, and other stops along the way, such as shrines for saints and local abbeys. 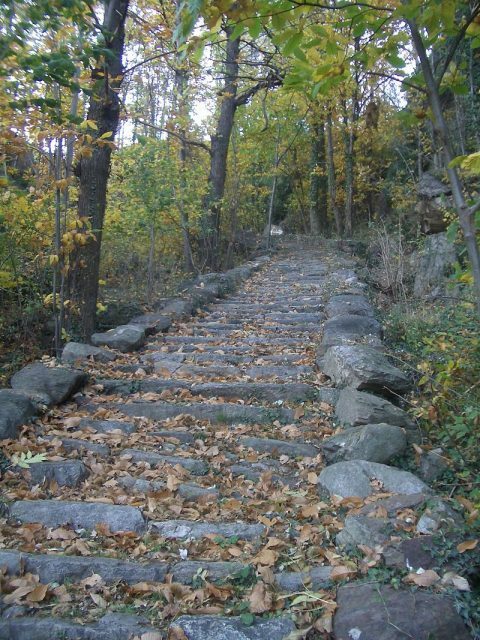 A steep section of the Via Francigena in Settimo Vittone, Piedmont. Sigeric traveled about 12 miles (20km) a day, and his return trip was broken down into 80 stages, his record now making up the official Via Francigena. Despite its popularity at the time, and the documentation of his route by Sigeric, the pilgrimage route was eventually lost to time and became known primarily only to scholars. 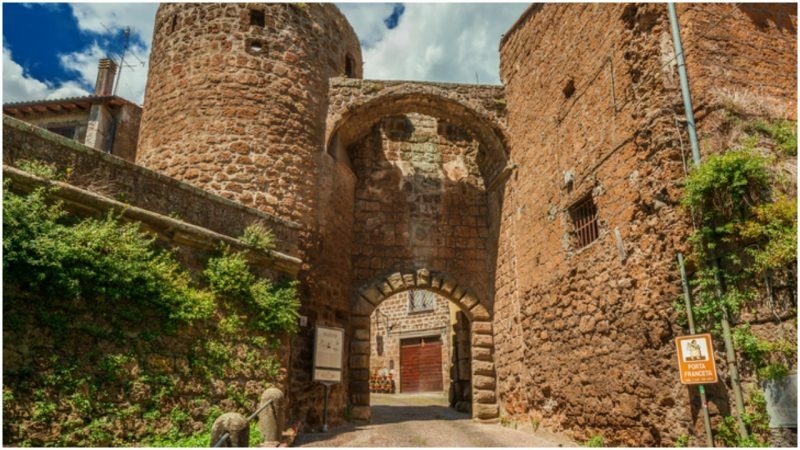 The walls of the medieval village of Monteriggioni, near Siena, Italy. This changed, however, in 1985, when an enthusiastic and well-traveled walker and anthropologist, Giovanni Caselli, was looking for something to write about for a new travel book. 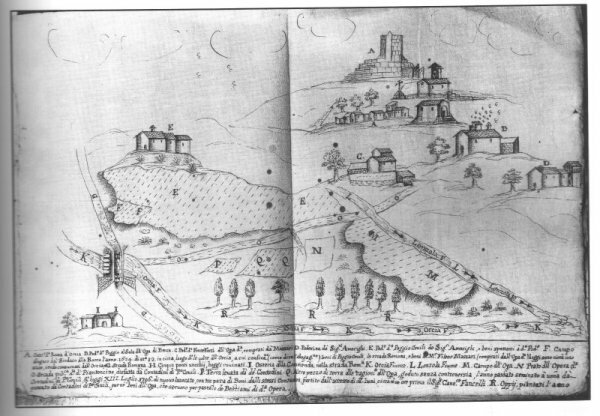 Mediaeval Italian manuscript depicting the Castle of Tentennano on the Via Francigena. He managed to walk from Canterbury to Rome and published a book in 1990 called Discovering the Via Francigena. In 1994, thanks to the attention the route received from Caselli’s book, the route became designated as one of the Council of Europe’s Cultural Routes, and it became a Major Cultural Route in 2004. 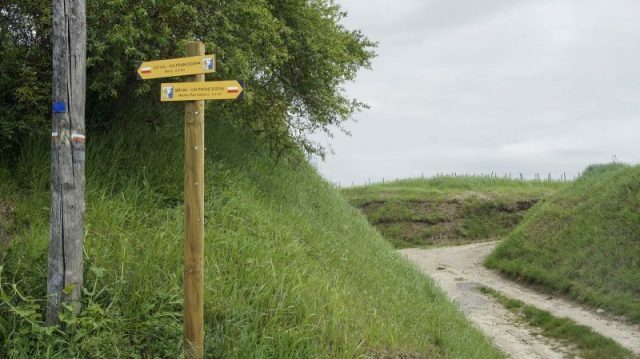 Today, there are fewer pilgrims on the Via Francigena than on the more famous Way of St. James to Santiago de Compostela in Spain. But it does not really matter. Because whether one is walking a pilgrimage all the way to Rome, or merely walking a portion of the route, the fact that, thanks to scholars like Caselli, we can still walk, literally, in the footsteps of medieval pilgrims and ancient Europeans is tremendous.